Please carefully review the following terms and conditions of use (the “Terms”), which govern your access to and use of www.fila.com (the “Site”) on any computer, mobile phone, tablet, console or other device, which is operated by Fila Online, Inc. (“Fila”). Your use of the Site constitutes your agreement to follow and be bound by the Terms. These Site Terms do not alter in any way the terms or conditions of any other agreement you may have with Fila for products, services or otherwise. RIGHT TO MODIFY TERMS Fila reserves the right to update or modify the Terms at any time without prior notice. Any changes or modification of the Terms will be effective immediately upon posting the revisions on the Site and shall apply to all use of the Site and all acts or omissions occurring after the effective date of the revised Site Terms. You waive any right you may have to receive specific notice of such changes or modifications. Your continued use of the Site following the posting of changes or modifications will confirm your acceptance of such changes or modifications. When we make changes, we will post them here. For these reasons, we encourage you to review the Terms whenever you use the Site. If you do not agree to these Terms, please do not use the Site. PERMITTED USES The Site may be used only for lawful purposes and is available only for your personal, noncommercial use, which shall be limited to viewing the Site, purchasing products, providing permitted information to the Site, and downloading product information for your personal review. You are responsible for your own communications, including the transmission, posting, and uploading of information and are responsible for the consequences of such communications to the Site. PROHIBITED USES Fila specifically prohibits any misuse of the Site and requires all users to agree not to use the Site for any of the following: Posting any information which is incomplete, false, inaccurate or not your own; Changing or deleting any ownership notices from materials downloaded or printed from the Site; Engaging in conduct that would constitute a criminal offense, give rise to civil liability or otherwise violate any city, state, national or international law or regulation that would fail to comply with accepted Internet protocol; Impersonating a third party or otherwise misrepresenting your affiliation with a third party or age; Soliciting personal information from anyone under 18 or soliciting passwords or personally identifying information for commercial or unlawful purposes; Communicating, transmitting, or posting material that is copyrighted or otherwise owned by a third party unless you are the copyright owner or have the permission of the owner to post it; Communicating, transmitting, or posting material that reveals trade secrets, unless you own them or have the permission of the owner; Communicating, transmitting, or transferring (by any means) information or software derived from the Site to foreign countries or certain foreign nations in violation of US export control laws; Using the Site in any unlawful manner or in any manner that could damage, disable, overburden or impair the Site; Attempting to interfere in any way with the Site or Fila’s networks or network security, or attempting to use the Site’s service to gain unauthorized access to any other computer system; Attempting to circumvent any content filtering techniques we may employ; Attempting to access any service or area of the Site that you are not authorized to access; Harvesting or collecting email addresses or other contact information of other users from the Site by electronic or other means for the purpose of sending unsolicited emails or other unsolicited communications; Using any robot, spider, crawler, scraper, interface, scripts, or other automated means to collect information or otherwise interact with the Site; Engaging in any harassing, intimidating, predatory or stalking conduct; and ▪	Using any metatags or any other "hidden text" utilizing "Fila" or any other name, trademark or product or service name of Fila or its subsidiaries without Fila’s prior written permission. RIGHT TO MONITOR AND TERMINATE USE Although Fila has no obligation to monitor any user conduct on the Site, Fila reserves the right, and has absolute discretion, to monitor any user conduct on the Site at any time and for any reason without notice. Fila reserves the right, without notice and in its sole discretion, to terminate your license to use the Site, and to block or prevent your future access to and use of the Site. Any use of the Site in violation of these Terms may result in, among other things, termination or suspension of your rights to use the Site. These Terms remain in effect even if your account is terminated. We strive to process all orders for in stock items within two (2) business day(s). Our standard business days are Monday through Friday, 8 am to 5 pm Eastern Standard Time. Standard shipping is typically via FedEx SmartPost and you should allow 7-10 business days for delivery once an order has been shipped. We reserve the right to substitute another carrier of equal or lesser cost to deliver your order. If expedited shipping is required (at additional costs), please select that as your shipping choice. Occasionally, orders with multiple items will ship separately. In the event this occurs, Fila will only charge the customer for the first package shipped; the remaining packages will be sent at the expense of Fila. Shipping charges will be included on your invoice and can be viewed on a summary screen prior to finalizing your order. Shipping charges are based on the delivery location and method you select during the checkout process and you can view our current shipping fee chart here. The shipping charge shown during the checkout process is subject to verification. Shipping charges are subject to change without notice, provided that if the actual shipping charge is more than the amount shown on your invoice, we will contact you with the correct shipping costs before processing your order, and you will have an opportunity to cancel your order. 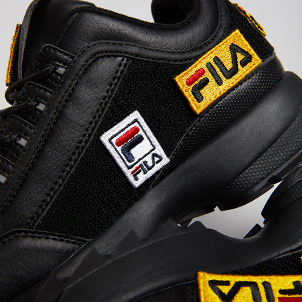 It is Fila’s policy to replace defective product within a one year time frame from the date of purchase. If you feel there is a defect in the Fila product you have purchased, please complete, print, and enclose the Quality Control Return Form with the returned product. If upon evaluation, the quality control division of Fila Online, Inc. determines that a manufacturing defect is present, we will gladly replace your item. However, if we do not have sufficient stock of your original style, we will replace the original with a style of equivalent value and comparable to that of which you purchased. When returning your merchandise, please be sure to provide us with the original or a copy of the receipt, along with the name and address of the store where you purchased this item. Should a receipt not be available, we would have to determine your date of purchase from our stock numbers. Each return will only be replaced once. Please allow up to eight (8) weeks for processing. Should your item be found not to be defective, our quality control department will return your original item to you with a written evaluation of its findings. Fila ships via FedEx only. If you are using a P.O. Box number for your address, please be sure to provide us with an alternate address. Fila only sells products to adults. If you are under 18, you may use the Site only with the involvement of a parent or guardian. Fila reserves the right to refuse service, terminate accounts, remove or edit content, or cancel orders in its sole discretion. SITE TRANSACTIONS Fila reserves the right to refuse any order you place with us. We may, in our sole discretion, limit or cancel quantities purchased per person, per household or per order. These restrictions may include orders placed by or under the same customer account, the same credit card, and/or orders that use the same billing and/or shipping address. In the event we make a change to or cancel an order, we will attempt to notify you by contacting the email and/or billing phone number provided at the time the order was made. We do not authorize the purchase of our merchandise for resale purposes. To enforce this policy, we reserve the right to limit or prohibit orders that, in our sole judgment, appear to be placed by dealers, resellers or distributors. We reserve the right to cease doing business with those customers violating this policy. We may modify this policy at any time without prior notice. RIGHT TO CHANGE SITE We reserve the right, at any time and in our sole discretion, to: modify, suspend or discontinue the Site or any service, content, feature or product offered through the Site, with or without notice; charge fees in connection with the use of the Site; modify and/or waive any fees charged in connection with the Site; and/or offer opportunities to some or all users of the Site. You agree that we shall not be liable to you or to any third party for any modification, suspension or discontinuance of the Site, or any service, content, feature or product offered through the Site. SITE CONTENTS AND LIMITED LICENSE Unless otherwise noted, the Site, and all materials on the Site, including text, images, illustrations, designs, icons, photographs, video clips and other materials, and the copyrights, trademarks, trade dress and/or other intellectual property in such materials (collectively, the “Contents”), are owned, controlled or licensed by Fila Online, Inc., and are protected by U.S. and international copyright laws. Fila® and other Fila-owned trademarks or logos displayed on the Site are owned by Fila Luxembourg S.a.r.l. and are used under license. The Site and the Contents are intended solely for personal, non-commercial use. You may only download or copy the Contents and other downloadable materials displayed on the Site for your personal use. No right, title or interest in any downloaded Content is transferred to you as a result of any such downloading or copying. You may not reproduce (except as noted above), publish, transmit, distribute, display, modify, create derivative works from, sell or exploit in any way any of the Contents or the Site. Unless otherwise specified, the Site and the Contents are intended to promote Fila’s products and services available in the United States. The Site is controlled and operated by Fila Online, Inc. from its offices in New York, NY. The Content of this Site may include features that promote physical activity. Consider the risks involved and consult with your medical professional before engaging in any physical activity. Fila is not responsible or liable for any injuries or damages you may sustain that result from your use of, or inability to use, the features of the Site. The Content of this Site does not constitute medical advice. You should consult your doctor before beginning any exercise, training or athletic program utilizing any product offered on this Site. Fila is not responsible for any medical or health problems that may result from your engaging in any activities described on the Site or from any information you obtain from the Site. COPYRIGHT COMPLAINTS Fila respects the intellectual property of others. If you believe that your work has been copied in any way that constitutes infringement, we suggest that first you consult your legal advisor, and then please provide Fila’s copyright agent, at the address below, the following written information: An electronic or physical signature of the person authorized to act on behalf of the owner of the copyright interest; A description of the copyrighted work that you claim has been infringed upon; •	A description where the material that you claim is infringing is located on the Site; •	Your full name, address, telephone number, and email address; A statement by you that you have a good faith belief that the disputed use is not authorized by the copyright owner, its agent, or the law; A statement by you, made under penalty of perjury, that the above information in your notice is accurate and that you are the copyright owner or authorized to act on the copyright owner's behalf. Fila’s Copyright Agent for notice of claims of copyright infringement on the Site can be reached as follows: Fila Online, Inc.
ATTN: Legal Department Please note that this procedure is exclusively for notifying Fila that your copyrighted material has been infringed. REPEAT INFRINGER POLICY In accordance with the Digital Millennium Copyright Act (DMCA) and other applicable laws, Fila has adopted a policy of terminating, in appropriate circumstances and at Fila’s sole discretion, subscribers or account holders who are deemed to be repeat infringers. Fila may also at its sole discretion limit access to the Site and/or terminate the accounts of any users who infringe any intellectual property rights of others, whether or not there is any repeat infringement. SECURITY RULES Violations of system or network security may result in civil or criminal liability. 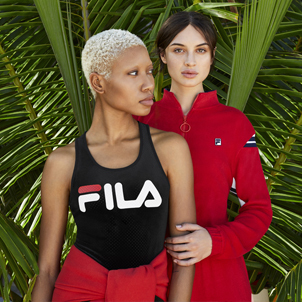 Fila will investigate occurrences and may involve, and cooperate with, law enforcement authorities in prosecuting any user or users who are involved in such violations. You are prohibited from violating or attempting to violate the security of the Site, including, without limitation, the following: Accessing data not intended for you or logging into a Fila server or account, which you are not authorized to access; Attempting to probe, scan or test the vulnerability of a system or network or to breach security or authentication measures without proper authorization (or succeeding in such an attempt); Attempting to interfere or interfering with the operation of the Site, our provision of services to any other visitors to the Site, our hosting provider or our network, including, without limitation, via means of submitting a virus to the Site, overloading, “flooding,” “mail bombing” or “crashing” the Site; or Forging any TCP/IP packet header or any part of the header information in any email or transmission or posting on the Site. USER SUBMISSIONS Any and all information, including but not limited to feedback, data, questions, comments, suggestions, or ideas that you submit on the Site shall not be deemed confidential, and Fila will not have any obligation to keep such information confidential and will be free to reproduce, use, disclose and distribute the information to others without limitation or liability. All such submissions shall be deemed the property of Fila, and your submission of information shall constitute an irrevocable assignment to Fila of all worldwide rights, titles and interests in and to such information. You agree that your submissions: (a) shall be true, accurate, current, complete and not misleading; (b) shall not violate the rights of any third party, including, but not limited to, intellectual property and proprietary rights; (c) shall not be fraudulent or involve counterfeit or stolen information or items; (d) shall not violate any law, statute, ordinance or regulation; (e) shall not contain libelous or otherwise unlawful, abusive or obscene material, or contain any virus or malware that could in any way affect the operation of the Site; and (f) shall not create any liability for Fila. Although we do not encourage idea submissions, please carefully review our Idea Submission terms here. LINKS TO OTHER WEBSITES AND SERVICES The Site may contain links to other websites that are not under the control of Fila. Fila has no responsibility for the linked websites nor does linking constitute an endorsement of any linked website. Links are provided solely for the convenience and information of the Site‘s users. USER CREATED HYPERLINKS TO SITE Fila grants Users a limited, non-exclusive right to create a text hyperlink to the Site for noncommercial purposes, provided such link does not portray Fila or any of its products and services in a false, misleading, derogatory or otherwise defamatory manner and provided further that the linking site does not contain any adult or illegal material or any material that is offensive, harassing or otherwise objectionable. This limited right may be revoked at any time. You may not use a Fila logo or other proprietary graphic of Fila to link to the Site without the express written permission of Fila. 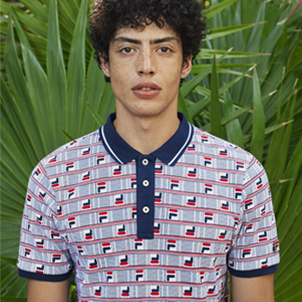 Further, you may not use, frame or utilize framing techniques to enclose any Fila trademark, logo or other proprietary information, including the images found at the Site, the content of any text or the layout/design of any page or form contained on a page on the Site without Fila's express written consent. Except as noted above, you are not conveyed any right or license by implication, estoppel or otherwise in or under any patent, trademark, copyright or proprietary right of Fila or any third party. Fila makes no claim or representation regarding, and accepts no responsibility for, the quality, content, nature or reliability of third-party Web sites accessible by hyperlink from the Site, or Web sites linking to the Site. Such sites are not under the control of Fila and Fila is not responsible for the contents of any linked site or any link contained in a linked site, or any review, changes or updates to such sites. Fila provides these links to you only as a convenience, and the inclusion of any link does not imply affiliation, endorsement or adoption by Fila of any site or any information contained therein. When you leave the Site, you should be aware that the Terms no longer govern. You should review the applicable terms and policies, including privacy and data gathering practices, of any site to which you navigate from the Site. DISCLAIMER The materials on the Site are provided “as is” without warranties of any kind, either express or implied, including without limitation, warranties of title, implied warranties of merchantability, fitness for a particular purpose or non-infringement of intellectual property. Fila expressly disclaims any duty to update or revise the materials on the Site, although Fila may modify the materials at any time without notice. Your use of the Site is at your sole risk, and you assume full responsibility for any costs associated with your use of the Site. Fila shall not be liable for any damages of any kind related to your use of the Site. LIMITATION OF LIABILITY IN NO EVENT SHALL FILA, ITS AFFILIATES OR ANY OF THEIR RESPECTIVE DIRECTORS, OFFICERS, EMPLOYEES, AGENTS, OR CONTENT OR SERVICE PROVIDERS BE LIABLE TO YOU FOR ANY DIRECT, INDIRECT, SPECIAL, INCIDENTAL, CONSEQUENTIAL, EXEMPLARY OR PUNITIVE DAMAGES, LOSSES OR CAUSES OF ACTION (WHETHER IN CONTRACT OR TORT, INCLUDING, BUT NOT LIMITED TO, NEGLIGENCE OR OTHERWISE) ARISING FROM OR IN ANY WAY RELATED TO THE USE OF, OR THE INABILITY TO USE, OR THE PERFORMANCE OF THE SITE OR THE CONTENT AND MATERIALS OR FUNCTIONALITY ON OR ACCESSED THROUGH THE SITE, INCLUDING, WITHOUT LIMITATION, LOSS OF REVENUE, OR ANTICIPATED PROFITS, OR LOST BUSINESS, DATA OR SALES OR ANY OTHER TYPE OF DAMAGE, TANGIBLE OR INTANGIBLE IN NATURE, EVEN IF FILA OR ITS REPRESENTATIVE OR SUCH INDIVIDUAL HAS BEEN ADVISED OF THE POSSIBILITY OF SUCH DAMAGES. TO THE FULL EXTENT PERMITTED BY LAW, FILA’S LIABILITY SHALL BE LIMITED TO THE AMOUNT ACTUALLY PAID FOR THE PURCHASE OF PRODUCTS FROM THIS SITE. FILA IS NOT RESPONSIBLE OR LIABLE FOR THE CONDUCT OF, OR YOUR INTERACTIONS WITH, USERS OF THE SITE (WHETHER ONLINE OR OFFLINE), NOR IS FILA RESPONSIBLE OR LIABLE FOR ANY LOSS, DAMAGE, INJURY, OR HARM ASSOCIATED THEREWITH. SOME JURISDICTIONS DO NOT ALLOW THIS LIMITATION OR EXCLUSION OF LIABILITY SO SOME OF THE ABOVE LIMITATIONS MAY NOT APPLY TO YOU. INDEMNIFICATION You agree to defend, indemnify and hold Fila, its directors, officers, employees, agents and affiliates harmless from and against any and all claims, damages, costs and expenses, including attorneys’ fees, in any way arising from, related to or in connection with your use of the Site, your violation of the Terms or the posting or transmission of any materials on or through the Site by you, including, but not limited to, any third party claim that any information or materials you provide infringes any third party proprietary rights. CHOICE OF LAW; VENUE These Terms, Sales Terms and your purchase of products from Fila through this Site shall be governed by and construed in accordance with the laws of the State of New York, without regard to any conflict of law provisions. Any dispute arising under these Terms and/or Sale Terms shall be resolved exclusively by an appropriate federal or state court sitting in the State of New York and you hereby irrevocably and unconditionally consent and submit to the exclusive jurisdiction of such courts over any suit, action or proceeding arising out of these Terms and/or Sale Terms. ENTIRE AGREEMENT These Terms constitute the entire agreement between you and Fila and govern your use of the Site. You also may be subject to additional terms and conditions that are applicable to certain parts of the Site. HEADERS The section titles in these Terms are for convenience only and have no legal or contractual effect. WAIVER The waiver of any provision of the Terms shall not be considered a waiver of any other provision or of Fila’s right to require strict observance of each of the Terms herein. SEVERABILITY If any provision of the Terms is found to be unenforceable or invalid for any reason, that provision shall be severable, and all other provisions shall remain in full force and effect. TERMINATION Fila may terminate these Terms and deny you access to the Site at any time, immediately and without notice if, in Fila’s sole discretion, you fail to comply with any provision of these Terms. CONTACT INFORMATION Questions or comments about the Site may be directed to Fila at the email address ecommusa@fila.com or by calling us at 1-800-845-FILA (3452).